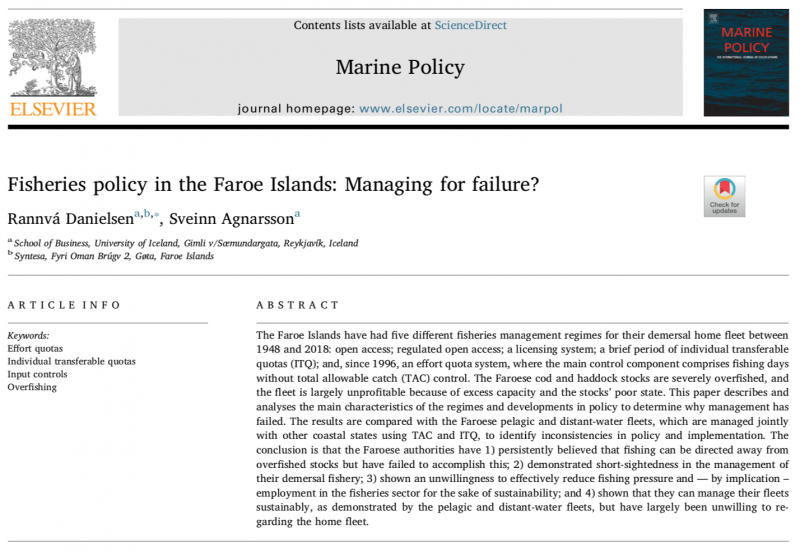 Our ESR Rannvá Danielsen has published the paper “Fisheries policy in the Faroe Islands: Managing for failure?” in Marine Policy. The paper explores fisheries policy in the Faroe Islands between 1948, when the Faroe Islands gained competence over fisheries policy, and 2018. In this time period, the Faroe Islands have gone through several different management regimes – open access, a licensing system, a brief period with individual transferable quotas, and, since 1996, a system with individual transferable fishing days. The paper concludes that the Faroese authorities have failed to limit the fishery in their own waters due a persistent belief that effort could be directed away from overharvested fish stocks, and have been resistant to following scientific advice, instead favouring high employment in the fishing industry. The result is overharvested stocks and a large fleet overcapacity.